In honor of Crazy Love, I think a song recommendation is over. Ever since I started this drama, Secret’s “Poison” has been stuck in my head. Why? Well there is a part of the song where they go “crazy love” but it also is a good representation of the various types of loves we have seen and will see. Being attracted to someone knowing you shouldn’t be and you’ll get hurt and that particular type of poisonous love that we see Hae Ryung exhibiting. So we open episode 3 with Mi Soo opening the door to her husband’s office to see what looks like Na Young and Min Jae making out. Mi Soo says nothing and can only stumble away in shock. After she leaves, the freaked out Min Jae finally manages to push Na Young away. She wishes to know what his problem is—why is them doing anything together so wrong? How isn’t it wrong? He’s a married man, you know. Does that matter when you’re in love? Love? Whose in love? Na Young wonders aloud if she was wrong as she thought Min Jae wanted her as well. Can’t he be honest with himself? Min Jae scoffs at this, but gets jumpy as Na Young stalks closer. She asks if can see her better now. Look closely. They are no longer coworkers. She had thought he felt the same way about her as she does with him. I love Min Jae’s reply. She’s selfish and doesn’t care about how anyone else feels. He wishes to make it clear. That night was a big mistake. He wishes that he could take an eraser to that night. Do you think Na Young believes him? Meanwhile, the startled Mi Soo wonders how her husband could do such a thing. She isn’t paying attention to the road in front of her and she nearly runs over a drunk who staggers into the street. Thankfully she manages to stop just inches from hitting him. After the drunk curses at her and staggers away, Mi Soo bursts into tears. Poor woman. Mi Soo was shaking so bad she called her friend to drive her home. Her friend wants to know if Mi Soo was bullied by her mother-in-law again to be so shaken. Mi Soo denies this. Then is something wrong with Hae Ram? Again, no. Then is it something to do with Min Jae—is he cheating? Mi Soo’s friend flips out. Mi Soo says it hasn’t been confirmed yet. So that means Mi Soo saw them together right? Her friend tells Mi Soo she can’t let such things go. If she won’t put her foot down and stand up for herself, her friend will help. Mi Soo thanks her [not sure of this character’s name yet] and goes into the house. Min Jae comes home in the early morning. Mi Soo asks why he came in so early when he was supposed to be back from work in the afternoon. Min Jae says he came home because he missed her and Hae ram. Mi Soo asks who he worked with and Min Jae blatantly lies to her. He says it is Park from the product division. He goes to hug Mi Soo who shrinks away from his touch, but he tells her to hold still and cuddles into her. She then tells him that he must be tired and to take a shower and rest. Mi Soo then goes into the kitchen and recalls her friend’s words. She packs up several containers of cookies and heads out. Where does she go? To Na Young’s apartment. Na Young is surprised to see her. Both girls are rather awkward around one another. Mi Soo says that she’s heard only praise from Myung Ja about Na Young and knows that Na Young is helping Min Jae often. Mi Soo thanks her for this and says he will repay Na Young later. Na Young immediately thinks that Hong Eun Joo is showing off being the president’s wife. Wrong. Mi Soo is just not that kind of a person. Na Young looks at the ring and Mi Soo explains what it is. Na Young then says that men often give gifts to their wives when they are seeing other women. Mi Soo assures Na Young that Min Jae is not the type who would ever cheat on her. Na Young smiles and says that Mi Soo has lots of trust in him. Of course, he’s Mi Soo’s one and only. If she doesn’t trust him, then who can she trust. What kind of love can last when it breaks other’s hearts? Whoever wants what belongs to someone else are the worst, don’t you agree? Na Young’s face is strained. She agrees that people who covet what other’s have are the worst and will definitely pay for it. Mi Soo says she shouldn’t be talking of such nonsense and gets up to leave. You got to love that they both think the same thing. Mi Soo talks of Na Young stealing her husband while Na Young talks of Mi Soo stealing her supposed life. Mi Soo shakily leaves and Na Young throws a hissy fit recalling Mi Soo’s words. She won’t let Mi Soo get away with what she’s done. Mi Soo did nothing, crazy lady. Mi Soo stops by a a store where she sees oranges. She recalls how Min Jae bought her two bags full of oranges when she was pregnant with Hae Ram. She decides to buy two bags this time as well. As she walks home, she is nearly hit by a bicycle and she drops her oranges. At this time Kyung Soo sees her and stops his car. He gets out to help her pick up her scattered fruit. Mi Soo nods her greeting and he asks if she’s on her way home. Yes. Kyung Soo then offers to give her a ride which Mi Soo rejects. Kyung Soo insists on taking her home and asks if she came that far to buy fruit. Mi Soo says she can buy good fruits cheaper in that area. Then why didn’t she drive as he saw she had a car at the orphanage? Mi Soo says she wanted to get some exercise. She had only planned to buy a few, but ended up getting all of them. Mi Soo says she will give them to the children. The Children at the orphanage? Yes. Mi Soo confesses that every time she sees good things priced cheaply, she buys a lot thinking to take them to the children first. Kyung Soo then ushers her inside his car. They arrive at the Lee household and Kyung Soo is surprised that Mi Soo lives there. She gets out and he follows. When does she go to the orphanage? Every other Wednesday. Kyung Soo goes to get back into his car, but Mi Soo turns and tells him to wait. She then comes over and hands him two oranges. They are a thank you for his help. Kyung Soo smiles happily to himself as Mi Soo heads into the house. You know… Min Jae isn’t a bad person and he is fighting against Na Young’s seduction attempts… but I just find myself liking Kyung Soo a wee bit better—I have no idea why that is. I guess… we’ll see who’ll man up in the end. Min Jae cannot stand up to his mother nor protect his wife all that well and Kyung Soo… he puts up with Crazy Wife and her demanding father. When push comes to shove, can he fight for what he wants? Myung Ja is with a fortuneteller. She has given him Na Young’s information, but it also looks like she’s given him Mi Soo’s, too, as he has a picture of Mi Soo along with Na Young’s employee profile. The fortuneteller says “she” will make her husband very successful and enjoy good fortune thanks to her son. You could bring this woman a homeless man and she’d make him the prime minister at least. This makes Myung Ja very happy. However, she doesn’t seem to notice that when the fortuneteller points at a picture, it isn’t Na Young’s, but Mi Soo’s. So I’m kind of confused. Is that really Na Young’s or Mi Soo’s fortune? I thought Mi Soo couldn’t have any children, so what’s this about a son? Oh well. We’ll find out won’t we? But…I have a strong feeling it is about Mi Soo. Even though Crazy Lady Na Young is smart and talented, she’s poison. I can’t imagine her bringing luck to anyone unless she clears out her own personal venom. 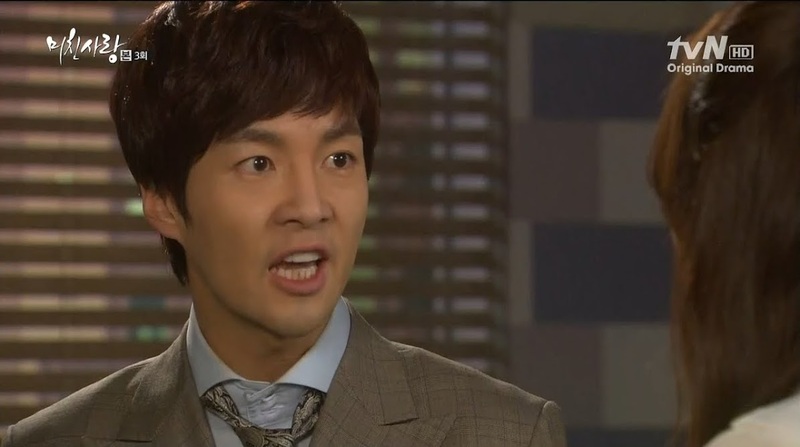 Myung Ja then goes home and demands that Mi Soo divorce Min Jae. Her daughter-in-law should think of it as saving a life. If Mi Soo does divorce her son, Myung Ja will pay off all debts and make sure Mi Soo and her family are comfortable. She will even help them emigrate. Mi Soo is shocked. How can her mother-in-law says that to her? Because her Myung Ja is a selfish witch. She’s not doing what’s in her son’s best interest, but her own since she isn’t even considering Min Jae’s feelings. Well…she does think that Min Jae might be having an affair with Na Young. Myung Ja tells Mi Soo that Min Jae is too softhearted to tell Mi Soo such things, so she will—Min Jae is seeing another woman. Myung Ja then tells Mi Soo to think about her offer. Mi Soo stops Myung Ja from leaving. 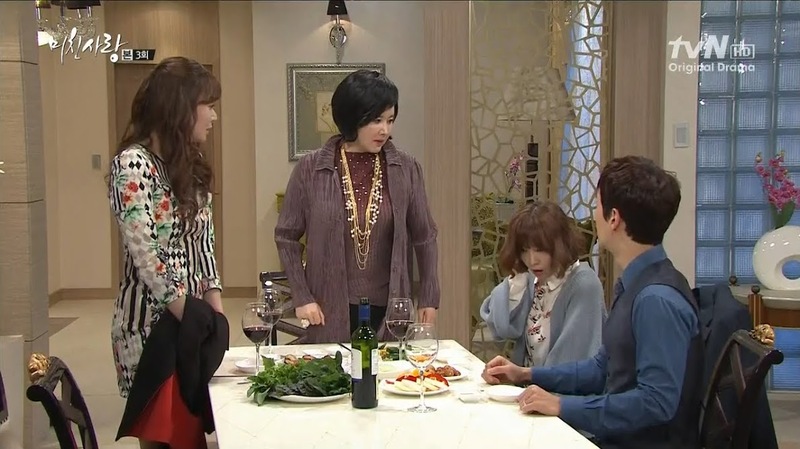 She will try to make it so her side of the family isn’t an eyesore to Myung Ja. She is also willing to adopt a son as Mi Soo is confident in raising an adopted child as her own since she grew up in an orphanage. This floors Myung Ja. What? An heir with no blood relation? She complains that Mi Soo pretends to be nice and dumb, but she is playing them all, isn’t she? How long will she stay and suffocate Min Jae? Mi Soo replies they are married. They share the same bed and have a daughter together. Myung Ja complains that Mi Soo is selfish and should want Min Jae to have something better. Hae Ryung is lifelessly watching ballet. Her mother peeks in at her daughter and then goes to Oh. She wants to send Hae Ryung and Kyung Soo to the villa at Tae Ahn. What did the doctor say? Hae Ryung’s mother replies that the doctor prescribed rest. Hae Ryung has some type of medical condition…is it a mental one? One that they are trying to keep on the down low so not even Kyung Soo is aware of it. Suspicious. In fact…I don’t know why, but this is the second time or so I was thinking of Charlotte Bronte’s Jane Eyre. Mr. Rochester was forced to marry a woman who was crazy. They hid her insanity up until the wedding and after it was too late, Rochester knew the truth. I’m also again reminded of Korean drama Bad Love. What’s his name’s wife was pretty crazy and a drunk, too. Okay. Enough digressing, I promise. At dinner, the Ohs ask about sending the kids to Tae Ahn. Hae Ryung at first says she doesn’t want to as it is too much of a hassle, but you can tell she’s interested and excited like a kid. Kyung Soo replies it is a busy time at the firm and he’s in the middle of big project. Oh shouts at him to shut up and do as he’s told and Hae Ryung says that he obviously doesn’t want to so Oh shouldn’t force him and she storms out of the room. Mrs. Oh scolds Kyung Soo for being difficult. Kyung Soo gets up to follow Hae Ryung and Oh mutters that Kyung Soo is ungrateful as it is thanks to Hae Ryung that he’s come as far as he has. Ouch. Burn. Mrs. Oh scolds Mr. Oh for saying that and rushes after Kyung Soo. 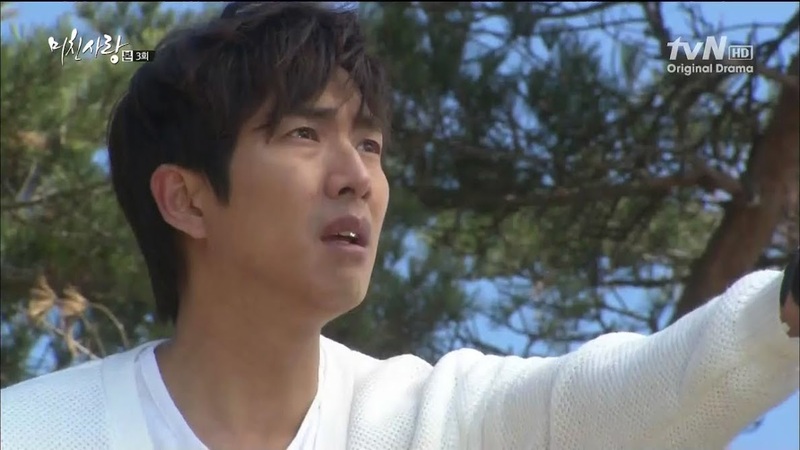 She asks him to reconsider the trip no matter how busy he is since it will make Hae Ryung very happy. We then cut to Yoon getting chased by Baek and his cronies. He is finally backed into the corner of a roof. He threatens to jump off if they don’t leave him alone. Baek says that isn’t the answer nor is running. If Yoon doesn’t have the money to pay off the debt, then he can sell some organs. Yoon cusses them out for being beasts and inhumane. Baek assures Yoon that he doesn’t wish to be doing this job either. Yoon then keeps inching closer and closer to the edge of the roof until the idiot loses his balance and falls off. Yes, he’s an idiot. You know, when Baek realizes the whole truth, you know he’s going to hate himself. Mi Soo rushes to the hospital where her friend from earlier [Jang Yoon Seo as Kim Jong Hee] is waiting for her. Baek is there as well, leaning against the building. Mi Soo demands to know how her father is and Jong Hee assures her he is fine since there are no life-threatening injures. Plus, he’s regained his consciousness. Mi Soo then turns to look at Baek. She says nothing and slaps him. Is money more important than a human’s life? She calls him inhumane. Baek tells her to bring the money to him and he’ll show her how humane he can be. Mi Soo then says she knows her father still owes a lot of money, but the goons shouldn’t be chasing him like that any more since he repaid 30,000,00 won. This, of course, is news to Baek. Is she kidding him right now? This confuses Mi Soo as she knows her husband gave her father money to help clear the debt. Mi Soo asks what happened and Baek tells her to pay back the money as soon as possible before he makes a new mess. Chan Ki then brings their father out and Mi Soo asks how he is. He assures her he is doing fine considering. Mi Soo then demands to know what happened to the money. Yoon cries and says he blew it at the track again. Mi Soo, Jong Hee, and Chan Ki are horrified by this. Mi Soo collapses to her knees and demands to know why her father is making things so hard on her. Yoon is back in his room and sleeping. Mi Soo sits by his side and comments on how old and haggard he’s looking. She apologizes for yelling at him. He raised her well, so she should not have said such a thing. She then apologizes for not being good enough so that he suffers so much, too. She is crying and apologizing and telling him that she loves him. She really is a softhearted and loving woman. She rushes out of the room and Yoon opens his eyes. He’s crying as well. Hae Ryung and Kyung Soo do end up going to the villa. Hae Ryung is a like happy little kid and Kyung Soo smiles at her antics. When they get back to the house from the beach, Hae Ryung makes dinner and asks him to try the food to see if it tastes all right. Kyung Soo, however, is busy working since another attorney is having a problem and needs his help. This annoys Hae Ryung. Does he have to work now? Kyung soo promises that he will be done in an hour. Hae Ryung then throws a fit. She throws all of the food and Kyung Soo demands to know what’s wrong. She only had to wait an hour? She then compares him to a cow dragged to a slaughterhouse and rushes out. Let’s see. This woman is paranoid. She seems to be manic depressive as well. She’s a whole bag of problems. Hae Ryung sits alone on their bed and recalls all her crazy moments with her husband. Accusing him of having an affair, threatening to kill the other woman and herself, etc. Morning comes and Hae Ryung goes out in to the living room where Kyung Soo is sleeping on the couch. She then recalls the moment when Kyung Soo asked to break of the engagement and cancel the wedding. 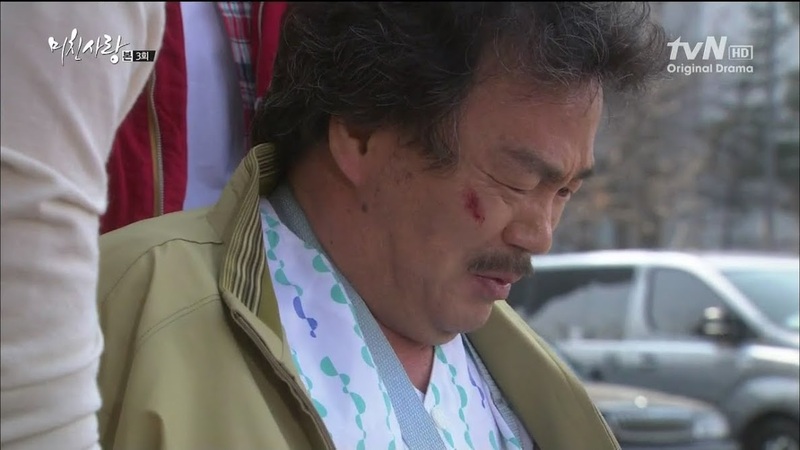 Hae Ryung grabbed the steering wheel of the car and nearly got them both killed. Thus she ended her ballet career as when she was hospitalized after the accident she learned she had spondylolysis (it’s a type of spinal defect particularly located in the lumbar vertebra—Google it). She will be able to live normally and walk normally, but she won’t be able to dance. Hae Ryung then begs her mother to lie to Kyung Soo and says that its thanks to the accident that she can’t dance. This way he won’t leave her as she can’t lose him. Sigh. Never a good idea to force a man into marriage because of your lies. We then cut to Hae Ryung crying and watching Kyung Soo sleep. She goes to the edge of a cliff overlooking the water and recalls Kyung Soo asking her in the hospital to marry her. Does she regret her actions now? She goes to walk off the cliff and Kyung Soo runs up yelling at her to stop. It’s dangerous. She should come down. 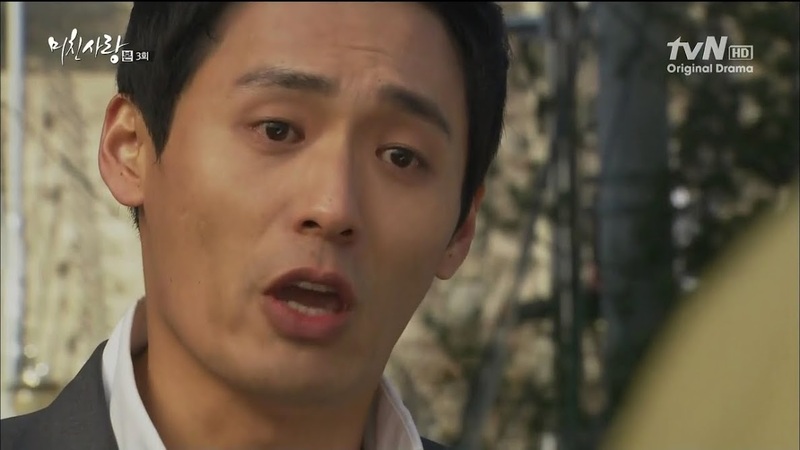 Hae Ryung turns and apologizes for being selfish and forcing him to marry her. Kyung Soo assures her that isn’t the case and begs her to come to him. Hae Ryung keeps inching backwards and nearly slips off the edge of the cliff. Kyung Soo manages to grab her before she falls and pulls her into his embrace. She complains about her life and asks to go home. Hmm…now only if she could let him go in a saner way. At the Lee house, Myung Jae has invited Na Young over and fawns over her in front of Mi Soo. She even asks Na Young to call her mother-in-law. Min Jae is not happy with this and calls Mi Soo over to join them and eat the delicacies his mother bought, too. Myung Ja urges her over as well. At this point, Kyung Soo arrives outside of the Lee house as he had to stop his car to look for some documents. Back in the house, Min Jae is livid about something. What exactly? Myung Ja has asked Mi Soo if she has thought about the divorce. Mi Soo is in shock. 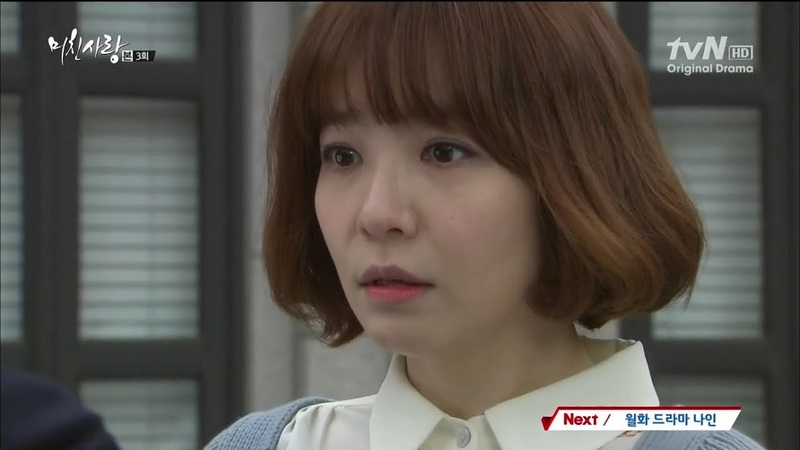 Myung Ja gives her only one week to make her decision. Na Young tries to get Myung Ja to calm down and Mi Soo tells her it is a family matter and to leave. This earns Mi Soo a slap across the face much to Na Young’s delight. Myung Ja then drags Mi Soo out of the house and yells at her to not come back until she agrees to divorce Min Jae. She then locks Mi Soo out of the house. This scene is witnessed by Kyung Soo who follows the shell shocked Mi Soo as she slowly walks away from the house. He eventually stops his car and gets out to follow her on foot. He notices a scooter coming at her and quickly grabs her to safety…which means he hugs her to him. 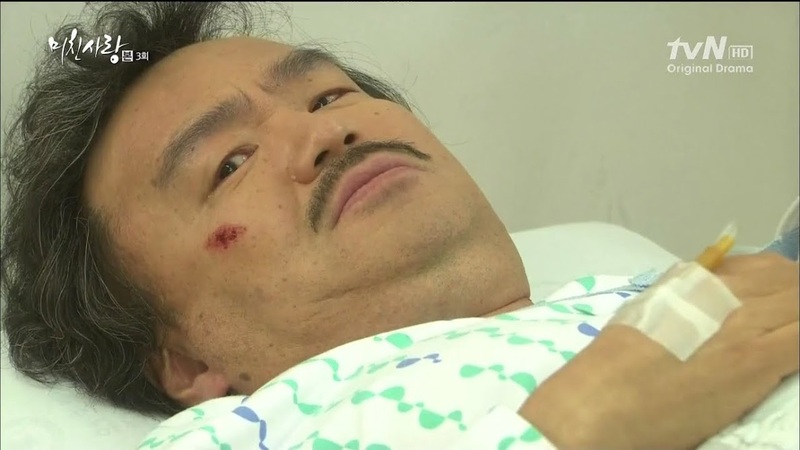 This surprises Mi Soo and that is where this episode ends. I really, really can’t stand Myung Ja. She is the worst of the worst of mother-in-laws I’ve scene in dramas, I swear. And given the scenes for episode 4, I’m hating on Min Jae. Mommy takes away his credit cards and he gets angry at his wife who has only been good to him and his evil mother? Sheesh. Thanks so much for the recaps. I kept on rewinding the part with the fortune teller, but no matter how I look at it the person in the picture looks like Na young. the poseof the person in the picture fits Na youngs personality as that of Mi So. The mother in law is clearly the weakest link. Who says crap like that?